The Clubhouse looks out over our beautiful golf course and provides stunning and relaxing views for all types of gatherings. 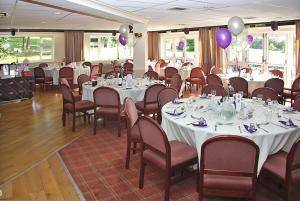 We can cater for small or large numbers of up to 120 either during the day or in the evening. There is free car parking for 100 cars with easy access for disabled visitors. We have a range of menus and drinks packages available for you to choose from - SEE HERE - or you can devise your own. We can also advise on or arrange any extras such as entertainment, flowers and celebrations cakes. Our sole aim is to ensure the success of your event. We have a flexible approach and our Catering and Bar Managers will be happy to discuss your specific catering and refreshment requirements. 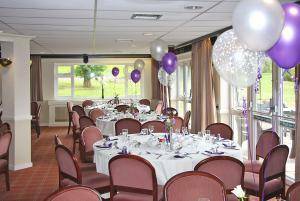 For more information on how we can cater for your event, please call the Club Manager on 0116 2393457 (option 1) for an informal chat or to arrange a visit to view our facilities.